Who Was Marduk -  An epic journey of new discovery so fantastic that our natural instinct would be to block it out. ​From Page 310 or Read the Chapter End of this Page. ​and patron deity of the city of Babylon. Marduk (Sumerian spelling in Akkadian: AMAR.UTU ‫⌓ "solar calf"; perhaps from MERI.DUG; Biblical Hebrew מְרֹדַךְ Merodach; Greek Μαρδοχαῖος, Mardochaios) was the Babylonian name of a late-generation god from ancient Mesopotamia and patron deity of the city of Babylon, who, when Babylon became the political center of the Euphrates valley in the time of Hammurabi (18th century BCE), started to slowly rise to the position of the head of the Babylonian pantheon, a position he fully acquired by the second half of the second millennium BCE. In the perfected system of astrology, the planet Jupiter was associated with Marduk by the Hammurabi period. 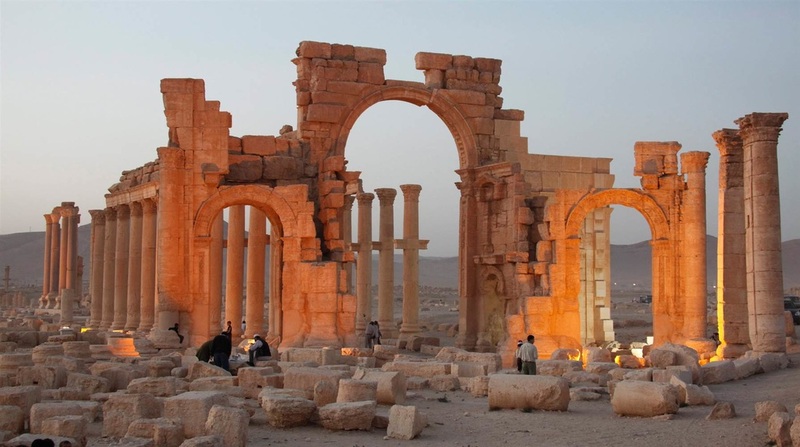 In April, part of the Temple of Baal that stood in Palmyra, Syria will be reconstructed in Times Square in New York City and in Trafalgar Square in London. The specific portion that is being erected in both cases is the 48-foot-tall arch that stood at the entrance to the temple. 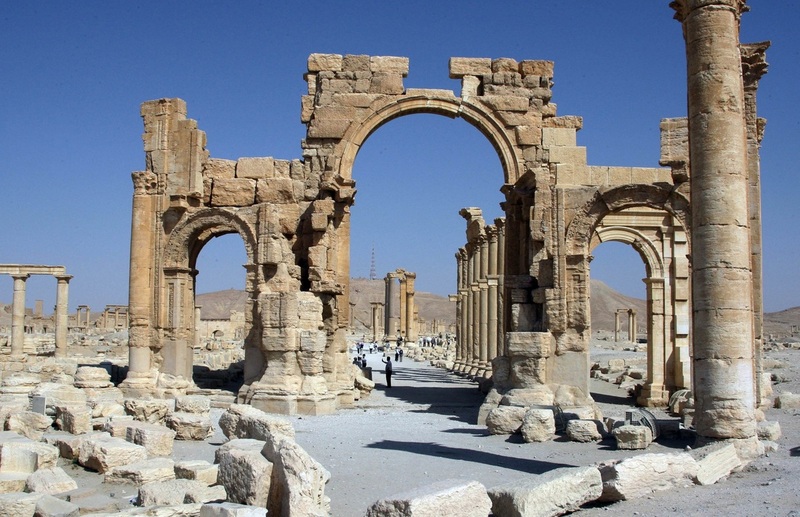 The Institute of Digital Archaeology is the organization behind this effort, and the display of these two arches is intended to be the highlight of UNESCO’s World Heritage Week late next month. After seeing my initial story, one of my readers observed that an arch is really just a gateway or a portal. In other words, it can serve as both an entrance and an exit. So could it be possible that we will be unknowingly setting up a gate or a portal of some sort in Times Square? The English Babylon comes from Greek Babylṓn (Βαβυλών), a transliteration of the Akkadian Babili. The Babylonian name in the early 2nd millennium BC had been Babilli or Babilla, which appears to be an adaption of an unknown original non-Semitic placename. By the 1st millennium BC, it had changed to Babiliunder the influence of the folk etymology which traced it to bāb-ili (“Gate of God” or “Gateway of the God“). The group’s rampage through Palmyra, a city that reached its peak in the second and third century A.D., enraged the world, spurring scholars and conservationists into action. Traditionally the Tower of Babel event has been associated with Nimrod, and Jewish commentaries as well as the Jewish historian Josephus both seem very emphatic on this point. After Enmerkar’s death he became honored in Sumerian myth as the semi-divine hero Ninurta, and eventually this cult evolved into the great cult of Marduk, which became the state religion of Babylon after the conquests and religious innovations of Hammurabi. The cult of Marduk was the root of all of the ancient pagan religions of the Middle East, Egypt, Greece and Rome. In those other religions, the deity of Marduk came to be known by other names such as Baal, Osiris, Apollo, etc. ... Mighty Marduk, the all powerful war god and sky god of the Babylonians, built Babylon as his home and created humankind to dwell there and toil there for the gods after he slew the evil Tiamat, so myth tells us. Son of Ea and Dumkina, Marduk began his existence in the deep abyss, in the heart of the holy Apsu. He was born whole, strong, and beautiful with four eyes and four ears, and it is said that he spat fire when he spoke. He had the gift of magic and command over the winds. Indeed, Marduk was a hero, a leader right from his birth. He belongs to the younger gods and was chosen King of the Igigi to destroy Tiamat. Tiamat, the terrible earth goddess, is primeval chaos. She belongs to the rank of the older gods, whom she has been threatening and abusing. And it is Marduk who is called upon to kill her in the Babylonian Creation Myth. The Babylonian Creation Myth tells of the battle between Marduk and Tiamat, between good and evil. This myth was most likely first written down between the 8th and 12th century BCE but it comes from an earlier time, from ancient Sumerian mythology, from the Enuma Elish. Marduk, greater than all the gods, was chosen avenger of the gods and made king. His heroic task was to kill Tiamat for her terror and abuse of the gods. So Marduk fashioned a net to ensnare her, then he called upon the winds and mounted his chariot led by his fierce team and set out after the great monster. He followed the sound of Tiamat's rage and found her. Tiamat tried to undo Marduk with spells and words, but Marduk was too clever for her. He challenged her to one-on-one battle and she accepted. They fought hard and finallyMarduk caught her in his net using the winds against her. Tiamat in return tried to swallow Marduk but he sent Imhullu into her. This wind raged through her body, holding her mouth open and blew her up. Then mighty Marduk shot an arrow, which pierced her belly, and her heart and he straddled her dead body in victory. Next, he destroyed her evil band of followers by trampling them into the ground and he recovered the Tablet of Destinies from them. Returning to Tiamat's carcass he wondered what to do with her remains, so he smashed her skull and severed her arteries, the blood streaming forth on the north wind to the far reaches of the world. He ripped her huge dead body in two and raised the top half to create the arc of the sky. Her eyes became the source for the Tigris and the Euphrates rivers and from her udders Marduk made the mountains. The gods rejoiced in Marduk's victory over the evil Tiamat and lavished him with gifts including his fifty names. Marduk surveyed the great expanse of the sky that he created and then chose Babylon as his home on earth and created humans to work the land. What does this myth tell us about the ancient Babylonians? It tells us that they revered their powerful god Marduk as the Great Creator, but it also gives us insight into what they thought of themselves. Since they were created by their god solely to work the land and serve the gods they did not expect much in the way of eternal salvation. They were at the mercy of their gods for their lives and then went to a dreadful afterlife. They were the servants, the slaves of the gods. But they rejoiced in life, in simply being alive, and they enjoyed what wonders life had to offer them. But wait! There's more to this story. When I was in grade school I was taught that the Asteroid Belt was a planet that formed with the rest of the solar system. It then, for some unstated reason, broke up. Today it is said that the Asteroid Belt never quite came together to be a planet. The model I was taught years ago had the Sun and planets forming together. The Sun was the big mass in the center of a rotating disk of gas, mostly hydrogen and helium, and dust, small clumps of atoms of heavier elements. This range of gravitational instability did not allow a planet to form. These chunks all got organized into circular orbits and now follow each other around the Sun. Ancient myth suggests however that there was a planet between Mars and Jupiter at one time. In the Babylonian Creation Myth this planet was destroyed by another object. In the creation myth the destroyed planet is called Tiamat. The destroyer is called Nibiru. Nibiru with a mass of eight times that of Jupiter would tear apart a planet if the encounter was close enough. Such a Nibiru would most likely be a brown dwarf star. A brown dwarf star is too big to be a planet and too small to light a nuclear fire and become a full-fledged star. So picture this. A brown dwarf star, Nibiru, entered into the solar system and came down a couple of diameters behind and under Tiamat. This close encounter tore her apart. In the perfect example of bad timing, Mars came up under Tiamat just as she is being pulled apart. Several large pieces fell into Mars's northern sea creating some hundred plus mile diameter volcanic vents. Massive amounts of magma poured out and boiled away the sea. Lomonosov and Lyot are remnants of this bombardment. They both show signs of multiple flows. There is at least one, and perhaps two, large vents at the southeast edge of the Cydonia plane. Lomonosov is thirteen hundred miles north of Cydonia with Lyot about the same distance east and a little north. There are several smaller vents in the northern lowlands adjacent to these major vents. With magma flowing from all these vents for hundreds of years a sea or two could easily be boiled off. On land the impacts created great shield volcanoes such as Olympus Mons, the largest volcano in the solar system. Nibiru, the destroyer of planets passes in front of Tiamat as it climbed back up out of the solar system pulling several large pieces with it. One of these pieces dropped off to take up a tilted eccentric orbit and becomes known as Pluto. Behind Nibiru trailed a cloud of debris that rained down on the four outer planets. Some of these took up orbits around the planets and became minor moons. Others fell into the planets. Their clear atmospheres were clouded by the turbulence of the falling remnants of Tiamat. Mars may have picked up one of two chunks of Tiamat. Phobos shows signs of layering. This is an indication of sedimentary or volcanic buildup. One of the asteroids we have pictures of looks like it broke off something. It looks like a broken rock. It is acknowledged as a broken rock. Where it came from is the speculation. I speculate it was Tiamat. They speculate it was a smaller chunk of something. Tiamat was a water world as were Mars and Earth. Venus is a sulfuric acid world. They are representative of the kind of life that might live on Venus, or here on Earth. They form snottites, a microbe that lives in a sulfuric acid bath of its own secretion. These snottites live in deep caves in total darkness. Living with these snottites is a small ecosystem that makes its living by eating the rock and making an ever-bigger cave. There is, of course, running water there. Liquid water is required for biological life. A star, such as the Sun is very hot. It is so hot that the atoms leaving the surface are missing an electron or three. It takes a while before they calm down enough to get together with other atoms to make molecules. Both hydrogen and oxygen boil off the Sun. Some of these molecules get together to form water too. At the other end of the solar system, out in interstellar space, it is very, very cold. Any water molecules that did clump up would be frozen solid. In between these two extremes is a band where there will be liquid water. Any solid objects in this range will collect water. Thus there is a band of liquid water around every star in the universe. Every place on Earth where there is liquid water there is life. The laws of the physical world, physics, chemistry and etc., are uniform throughout the known universe. Thus there is biological life throughout the known universe. Tiamat was a water world. Some of this water fell on Mars. In one case it was an iceberg that impacted a hardened lava crust over a molten underflow. Even now there is liquid flowing out from under the surface of Mars. Elsewhere is the solar system Uranus is laying on its side. Venus is upside down. And Pluto not only is almost upside down, its orbit is the most irregular of the known planets. "In those days Noah saw that the earth became inclined, and destruction approached." The ancient Babylonian deity Marduk was associated with the planet Mars and was the origin of the legends and lore of that planet as well as many later gods and heroes. Marduk originated as the apotheosis of the biblical Nimrod. The book of Genesis lists Nimrod as a descendant of Ham, the third son of Noah. After the flood when men began to multiply once again and to establish settlements, the majority of Noah's descendants evidently settled together in the valley of Mesopotamia, though a few spread out into Palestine and north-west Africa. After about a thousand years (exact date unspecified in the Bible), (Nimrod was born in what is now Ethiopia.) ??? According to tradition, Nimrod set out to establish himself an empire and began by conquering the cities which had become established in Mesopotamia. Among these were Babel, Erech, Akkad, and Calneh in Sumeria, and in Assyria the cities of Rehoboth, Calah, and Resen. Besides conquering these seven cities he also founded Ninevah. The Bible is specific in stating that he was the first man after the flood to become an emperor. He seems to have been impelled and empowered by super-human force and his onslaught was irresistible. Genesis 10 describes Nimrod as a "mighty hunter before the LORD." The term is not complimentary, but implies ruthlessness and a lust for power. After establishing his kingdom in the Tigris / Euphrates region Nimrod consolidated his power by establishing a state religion. He constructed a religion that included deification and worship of the emperor (himself), worship of Satan and his demons, and star-worship (corrupted from a pure antediluvian astronomy). A key unifying factor in his religion was to be an astronomical/astrological observatory built upon the pinnacle of a pyramid, or tower, at Babel. It has been suggested that Nimrod spent some time in Egypt before moving up to Mesopotamia and that while in Egypt he studied the Egyptian mystery religion perpetuated there from before the flood by the wife of Ham, whom tradition takes to be a descendant of Cain. The building of this pyramid (or ziggurat) was interrupted by God himself in order to prevent Nimrod from extending his sway over all of the inhabited earth, according to Genesis. God halted the work by confusing their language so they could no longer cooperate easily with one another, nor indeed easily inhabit the same region together. As a consequence the human race was dispersed, and as men scattered they carried with them remnants of primeval revelation from God, and Satan/hero worship which Nimrod had invented as well. This system of muddled half-truths is known today to Bible scholars as the "Babylonian Mystery Religion." From a biblical point of view this religious system is described as the well-spring for all subsequent false religion and endless mythological systems, (For example see Isaiah 47 and revelation Chapters 17 and 18). ENKI The god of wisdom, incantations, and the deep waters of the oceans. This god was also called APSU, from which comes the name Poseidon. ASTALLUHI The son of ENKI/APSU was the god of healing and exorcism. The temple of Marduk at Babylon was called the Esagila after him. This name is the original of the Greek Aesculapius. Astalluhi was also the god of wisdom like his father but in addition the god of instruction and the tutor of many of the other gods and heroes of the Babylonian pantheon. This aspect of his personality became associated with the Greek centaur Chiron who fulfilled a similar function. The Titan Atlas also derives his name and personality from this god. This was the primary name by which other nations (including Israel) were introduced to the worship of Marduk. Baal means "lord" or "master". Under this name with many prefixes and suffixes he was worshiped by the Canaanites, Phoenicians, Syrians and to some extent by the Egyptians. Later, the Greeks associated him with Hercules under the name Melkarth which is a transliteration of Marduk. The name Baal sometimes occurs in connection with a locality such as "Baal-Peor" or "Baal-Hermon". More frequently it occurs with compound attributes such as "Baal-zebub", "lord of the flies", still today one of the epithets of Satan. "Baal-zephon" later to be the god Triton means "lord of the black north, or the northern void", and "Meri-Baal" translates as "lord of the rebellion". NABUL/NEBO The prophet. This god was the son of Marduk associated with prophecy received by singing, chanting and muttering (in "other tongues"); as well as oracles. He was the original of both Apollo (Nabul) and Hermes as the Greeks knew them. The names Nabul and Bel were the official names of Nimrod/Marduk in later periods and were popular in later periods among the ruling classes of Babylon as name elements as in NEBUchadnezzar and BELshazzar. As a note on the Babylonian mystery religion, the original cult of the mother and child, Semiramis and Tammuz, became later Isis and Osiris, Venus and Adonis, the madonna and child in various cultures down to this day. There is one common element to Nimrod/Marduk in all his manifestations and that is the symbol of the snake/serpent/dragon. Nimrod took the dragon as his personal emblem, so that from him spring various dragon myths and their special association with apocalyptic events. Strikingly the only favorable accounts of dragons are found among the Hamitic peoples of the world (like Nimrod) including the Ethiopians, Hittites, Chinese, Japanese and American Indian. The thread of serpent lore is evident in all of Marduk's guises regardless of nation, pantheon, or role. Poseidon was accompanied by creatures who were half man and half snake as well as by the sea serpent Leviathan (mentioned in Job). Aesculapeus/Chiron/Hermes were all associated with the cadduceus of entwined serpents. The story of Apollo and the python is well known as that of Hercules/Melkarth and the Hydra. The god Triton was half snake. That the worship of Nimrod and Semiramis is the origin of all the pagan systems on earth is well documented by Alexander Hislop in his book, The Two Babylons which contains many sound facts in spite of the author's anti-Roman-Catholic sentiments which appear to some readers as too strong. The Bible reveals that the ultimate source of all this evil is not to be sought in Nimrod the man (the first of the post-flood antichrists), but rather in the evil character of the one who possessed him, namely Satan. In many passages throughout the Bible the following associations are made about Satan: the serpent in Eden, Leviathan the sea monster, the dragon, "that ancient serpent", "the god of this age", the king of Babylon, the king of Tyre (Phoenicia), the king of Egypt (pharaoh), the father of lies, the prince of the power of the air, etc. In Isaiah 14 he is spoken of as the instigator of war in the heavens (space) by attempting to "ascend to the sides of the north" in order to seat himself upon the throne of God and thus to rule the universe. Thus he is the "lord of (the) rebellion" and "lord of the black void of the north". The primeval astronomy, of which Babylonian astrology, (still extant today) was a corruption, was based on the realization that the entire universe was created and had worth only in relation to the earth. Thus the ancients saw it as no accident that the stars and planets were set in a certain order by God at creation (see the classic books by Seiss and Bullinger on this subject). The antediluvian patriarchs developed a system of constellations to serve as perpetual reminders of man's fall and the promise of a coming redeemer as well as a record of the angelic conflict down through the ages. At the most prominent place in the heavens the patriarchs placed the constellation Draco, the dragon, which lies coiled about that point of the sky they called "absolute north". This is the center of the circle which the earth's north pole describes in the sky every 25,858 years. About 4000 BC the star Iota Draconis was the nearest visible star to the north pole, while about 3000 BC the north pole centered exactly on the star Alpha Draconis (also called Thuban), the brightest star in the constellation. This portion of the Dragon is depicted as attempting to encoil the constellation Ursa Minor which was originally called the "little flock", or "little sheepfold", namely the faithful remnant of Israel or the people of God. We find this exact picture written in the prose of the book of Revelation, Chapter 12, describing events yet to be enacted in human history! That is, the most devastating battle of all is yet to be fought on earth and in space ("the heavens"). The pole star today is of course Polaris in Ursa Minor and will next enter the constellation Cepheus, which constellation pictures God as the triumphant king over all the earth. It is also notable that in primeval astronomy the dragon's head is shown as being crushed under the foot of a hero who at the same time is using a club to beat to death the Hydra who has stolen the fruit of immortality. Head to head with this hero, set in mirror-image across from him is a second hero grappling with a huge snake whose gaping jaws are straining to grasp "Corona Borealis", the Crown of the North. This second hero is also crushing a vile enemy underfoot, this time it is the scorpion, yet even as he does this another scorpion bites his heel. This early configuration of the constellations around the north pole was derived from Biblical ideas about the events recorded much later in Genesis. The Babylonian Creation Epic describes Marduk leading a rebellion of the gods against Tiamat who has planned destruction for them. The Hebrew cognate for Tiamat is TEHOM used in the Bible only to describe "the deep" upon which God moved at the beginning of creation. Later a part of the "tehom" was imprisoned within the bowels of the earth (in Jewish rabbinical tradition) and opened to release the "waters from below" at the same time the vapor canopy collapsed during the flood in order to destroy the civilization of Noah's day. This destruction is said to have come about because on excessive influence by Satan in the affairs of men, such as intermarriage with mortals producing giants on the earth with various genetic defects of a serious nature. In the Babylonian version Marduk wins and is eulogized by the other gods in a list of fifty names to which can be traced most of the gods of antiquity. This epic was read aloud every New Year's day in Babylon in front of the statue of Marduk. New Year's Day was the most important day of the Babylonian calendar and during the ceremonies the statues of Marduk and his son Nabul were carried to a special shrine outside of the city where Marduk would prophecy and Nabul would interpret his words (the beast and false prophet imagery of Revelation l3). The statue of Marduk ands its attendant regalia were captured by conquerors several times, and their return was always connected with re-incarnation and the resumption of his rule over the earth. Marduk was the great god of war and only once in all his battles was he wounded when his helmet slipped from his head. As a result he received a fatal blow but being a god reincarnated himself. It was in his warrior aspect that he was related to Mars, the god of war. The Bible speaks of Satan temporarily regaining rule over the earth at the end of our present age through "the beast and the false prophet". The first is a civil military leader in Europe or the west, the latter is a false messiah (in Israel in all probability), the latter is thought to be a religious as opposed to secular leader. These two will "make war on the people of God" and the false prophet will proclaim himself to be God in the Third Temple in Jerusalem (see Matthew 24) at which point earth will enter a period known as "the time of Jacob's trouble" spoken of by the Hebrew prophets or the 3-1/2 year "great tribulation" known to Christians. At the conclusion of this catastrophic time when most life on earth is destroyed, Jesus will return to the Mount of Olives to usher in a millennial kingdom during which time Satan will be "bound" and removed from influence on earth. Is it then a coincidence that our computer conference has now come to believe that we may have found the image of an angelic malevolent being on Mars, a planet which appears to be scarred by an ancient war in the heavens? Is it a coincidence that we should find out such things as these as our own planet enters times of momentous problems beyond the capabilities of mere men to solve? It is remarkable that there is a syllable with the consonant value "M*R" which is found everywhere in connection with the planet Mars, the god of Mars, and its associated emblem, the dragon. The source of all these words is to be found in the Semitic roof "marah" (M*R) which in Hebrew means bitterness as well as disobedience. From this roof is derived "marad" (M*R*D), or rebellion, which is the original both of Nimrod (the Babylonian Nin-Mir-Rud), or (N*M*R*D), as well as Marduk/Merodach (M*R*D*K). The Bible tells us that Nimrod was the founder of Ninevah, and Nineveh's own half-legendary history ascribes that honor to one Ninur or Nimur (N*M*R). Marduk was the original in both name and character of the gods Mercury (M*R*K*R) and Mars (M*R*TS) from which of course we derive the current names of these planets. It is notable that Mercury, like Mars, is also "battle-scarred". Under the name Apsu (P*S), Marduk became Poseidon (P*S*D*N) who founded Atlantis which was named after his son Atlas (T*L*S), the Babylonian Astalluhi (S*T*L*). Atlantis was overthrown in the throes of a great war bringing destruction and dissolution upon the land. The only remnant of Atlantis was the island Hesperus (S*P*R) upon which lived a dragon in possession of the fruit of the tree of life (immortality). This fruit was stolen by the god Hercules/Melkarth (M*L*K*R*T), a pseudonym of Marduk (M*R*D*K). The people of Atlantis, called Merodes (M*R*D) were descendants of Merou (M*R) or Merod (M*R*D). The Nubians tell of an island called Meru upon which were built pyramids by a race of red men. This legend came to the Hindus as the FIVE-SIDED mountain they call Meru (M*R) ruled over by Indra, (N-M*D*R) who was the mouthpiece of god and himself a god. He conquered seven cities and ruled over the earth in Hindu mythology. Meru was a five-sided mountain from which the heavens were suspended with the pole star as its apex. This is the reason Asian temples are built in the shape of a mountain having a flame at the summit. Here also we see Atlas who became a mountain and bore the heavens on his shoulders, relieved only once by Hercules/Melkarth. Tibetan legend tells of the fall of the "land of seven cities" by earthquake and eruption at the fall of the star Bel (Mars). The people perished it is said because they ignored the warnings of their priest, Mu (M). Another lost-continent myth is that of Mu or Lemuria (L*M*R) which was publicized by James Churchward in the 19th century. According to him, Mu was situated in the Pacific Ocean and bore a population of 64 million people of assorted colors and tribes. Mu sank when gas-filled caverns in the earth beneath collapsed. The survivors founded colonies in Micronesia, China and Egypt but the only place they flourished was in Central America where they are said to have produced great Indian cultures. This may seem to be an insubstantial myth until one considers a modern day popular religion, Mormonism. Mormonism is founded upon the supposed revelation to Joseph Smith of a set of golden tablets by the angel Moroni (M*R*N) who had once been a human prophet to the great cities of central America said to have been founded by refugees from the Tower of Babel (Bab-El means "the gate of god" and also "confusion"). Moroni's warnings went unheeded and so they perished, but his prophecies were supposed to have been written down and given to Smith. This Moroni, from whom the Mormons are named, identifies himself with Quetzalcoatl/Kulkulkan, the winged-serpent and hero-god who brought civilization to the Aztecs and returned home on a raft of snakes over the sea. Doomsday came in the twenty-fourth year when Abraham, encamped near Hebron, was ninetynine years old.
'" And the Lord appeared unto him in the terebrinth grove of Mamre as he was sitting at the entrance of the tent, in the heat of the day. And he lifted his eyes and looked, and behold—three men were stationed upon him; and as he saw them he ran from the en- trance of the tent towards them, and bowed to the ground." Swiftly, from a typical Middle Eastern scene of a potentate rest- ing in the shade of his tent, the biblical narrator of Genesis 18 raised Abraham's eyes and thrust him—and the reader, too—into a sudden encounter with divine beings. Though Abraham was gazing out, he did not see the three approaching: they were sud- denly "stationed upon him." And though they were "men," he at once recognized their true identity and bowed to them, calling them "my lords" and asking them not to "pass over above thy ser- vant" until he had a chance to prepare for them a sumptuous meal. It was dusk when the divine visitors finished eating and resting. Asking about Sarah, their leader said to Abraham: "Return I shall unto thee at this time next year: by then Sarah thy wife will have a son." And the men rose up from there to survey over upon Sodom. "Can I conceal from Abraham that which I am about to do?" Recalling Abraham's past services and promised future, the Lord then disclosed to him the true purpose of the divine journey: to verify accusations against Sodom and Gomorrah. "The outcry regarding Sodom and Gomorrah being great, and the accusation against them being grievous," the Lord said he had decided to "come down and verify; if it is as the outcry reaching me, they will destroy completely; and if not, I wish to know." The ensuing destruction of Sodom and Gomorrah has become one of the most frequently depicted and preached-about biblical episodes. The orthodox and the Fundamentalists never doubled that the Lord God had literally poured fire and brimstone from the skies to wipe the sinful cities off the face of the earth. The scholarly and sophisticated have as tenaciously sought to find "natural" ex- planations for the biblical story: an earthquake; a volcanic erup- tion; some other natural phenomenon which (they grant) might have been interpreted as an act of God. a punishment befitting the sin. But so far as the biblical narrative is concerned—and until now it has been the only source for all the interpretations—the event was most definitely not a natural calamity. It is described as a premedi- tated event: the Lord discloses to Abraham ahead of time what is about to happen and why. It is an avoidable event, not a calamity caused by irreversible natural forces: The calamity shall come to pass only if the "outcry" against Sodom and Gomorrah will be confirmed. And thirdly (as we shall soon discover) it was also a postponable event, one whose occurrence could be made to happen earlier or later, at will. Realizing the avoidability of the calamity, Abraham embarked upon a tactic of argumentative attrition: "Perhaps there be fifty Righteous Ones inside the city," he said. "Wilt thou destroy and not spare the place for the sake of the fifty Righteous Ones within it?" Then he quickly added: "Far be it from you to do such a thing, to slay the righteous with the guilty! Far be it from you. the Judge of All the Earth, not to do justice!" A mortal preaching to his Deity! And the plea is for calling off the destruction—the premeditated and avoidable destruction—if there be fifty Righteous Ones in the city. But no sooner had the Lord agreed to spare the city if there be found such fifty persons than Abraham, who might have chosen the number fifty knowing that it would strike a special chord, wondered out loud if the Lord shall destroy if the number were five short. ​When the Lord agreed to call off the destruction if only forty-five be found Righteous. Abraham continued to bargain the number down to forty, then thirty, then twenty, then ten. "And the Lord said: 'I shall not de- stroy if there be ten'; and he departed as he finished speaking to Abraham, and Abraham returned to his place." At evetime, the two companions of the Lord—the biblical narra- tive now refers to them as Mal'akhim (translated "angels" but meaning "emissaries")—arrived at Sodom, their task being to ver- ify the accusations against the city and report their findings back to the Lord. Lot—who was sitting at the city's gate—recognized at once (as Abraham had done earlier) the divine nature of the two visitors, their identity evidently being given away by their attire or weapons, or perhaps by the manner (flying over?) in which they arrived. Now it was Lot's turn to insist on hospitality, and the two ac- cepted his invitation to spend the night at his home; but it was not to be a restful night, for the news of their arrival had stirred up the whole city. "They had hardly lain down when the people of the city, the people of Sodom, surrounded the house—young and old, the whole population, from every quarter; and they called unto Lot and said unto him: "Where are the men who came unto you tonight? Bring them out to us, that we may know them.' " When Lot failed to do so. the crowd surged to break their way in; but the two Mal'akhim "smote the people who were at the house's entrance with blind- ness, both young and old; and they wearied themselves trying to find the doorway." Realizing that of all the townspeople only Lot was "righteous," the two emissaries needed no further investigation; the fate of the city was sealed. "And they said unto Lot: 'Who else hast thou here besides thee—a son-in-law, thy sons and daughters, any other relative—all who are in this city—bring them out from this place, for we are about to destroy it.' Rushing to convey the news to his sons-in-law, Lot only met disbelief and laughter. So at dawn the emissaries urged Lot to escape without delay, taking with him only his wife and their two unmarried daughters who lived with them at home. and they brought them out, and put them down outside the city. where in the plain," they instructed him; "unto the mountains es- cape, lest thou perish." But Lot. afraid that they would not reach the mountains in time and "would be overtaken by the Evil and die," had a suggestion: Could the uphcavaling of Sodom be de- layed until he had reached the town of Zoar, the farthest one away from Sodom? Agreeing, one of the emissaries asked him to hurry there: "Haste thee to escape thither, for I will be unable to do any- thing until thou hast arrived there." The calamity was thus not only predictable and avoidable but also postponable; and it could be made to afflict various cities at different times. No natural catastrophe could have featured all these aspects. And the Lord rained upon Sodom and Gomorrah, from the skies. Brimstone and fire that had come from Yahweh. and all the vegetation that grows from the ground. The cities, the people, the vegetation—everything was "upheav- aled" by the gods' weapon. Its heat and fire scorched all before it: its radiation affected people even at some distance away: Lot's wife, ignoring the admonition not to stop to look back as they were fleeing away from Sodom, turned to a "pillar of vapor. "* The "Evil" Lot had feared had caught up with her. . . .
*The traditional and literal translation of the Hebrew term Netsiv melah has been "pillar of salt," and tracts have been written in the Middle Ages explaining the process whereby a person could turn into crystalline salt. However, if—as we believe—the mother tongue of Abraham and Lot was Sumerian. and the event was first recorded not in a Semitic language but in Sumerian. an entirely different and more plausible understanding of the fate of Lot's wife be- comes possible. For when the gods devastated the c i t i e s of the plain, the gods remembered Abraham, and sent Lot away out of the upheavaling of the cities. And Lot, as instructed, went on "to dwell in the moun- tain . . . and dwelt in a cave, he and his two daughters with him." "Our father is old. and there is not a man on Earth to squire us in the manner of all on Earth; come, let us make our father drink wine, then lie down with him. so that we shall preserve the seed of life from our fa- ther.' " And having done so, both became pregnant and bore children. The night before the holocaust must have been a night of anxiety and sleeplessness for Abraham, of wondering whether enough Righteous Ones were found in Sodom to have the cities spared, of concern about the fate of Lot and his family. connection it is noteworthy that in Ugaritic texts, such as the Ca- naanite tale of Aqhat (with its many similarities to the tales of Abraham) the death of a mortal by the hand of a god was described as the "escape of his soul as vapor, like smoke from his nostrils." The people I will make vanish, their souls shall turn to vapor. It was the misfortune of Lot's wife to be among those who were "turned to vapor." The region of the Plain; and he beheld there smoke rising from the earth as the smoke of a furnace." He was witnessing a "'Hiroshima" and a "Nagasaki" —the de- struction of a fertile and populated plain by atomic weapons. The year was 2024 B.C. Where are the remains of Sodom and Gomorrah today? Ancient Greek and Roman geographers reported that the once- fertile valley of the five cities was inundated following the catastrophe. Modern scholars believe that the "upheavaling" described in the Bible caused a breach in the southern shore of the Dead Sea, letting its waters pour through to submerge the lowlying region to the south. The remaining portion of what was once the southern shore became the feature figuratively called by the natives el-Lissan ("The Tongue"), and the once- populated valley with its five cities became a new, southern part of the Dead Sea (Fig. 102) s t i l l bearing the local nickname "Lot's Sea." In the north the outpouring of the waters south- ward caused the shoreline to recede. The ancient reports have been confirmed in modern times by various researches, beginning with an exhaustive exploration of the area in the 1920s by a scientific mission sponsored by the Vati- can's Pontifical Biblical Institute (A. Mallon, V oyage d'Exploration au sud-est de la Mer Morte). Leading archaeologists, such as W . F. Albright and P . Harland, discovered that settlements in the mountains around the region were abruptly abandoned in the twenty-first century B.C. and were not reoccupied for several cen- turies thereafter. And to this very day. the water of springs sur- rounding the Dead Sea has been found to be contaminated with radioactivity, "enough to induce sterility and allied afflictions in any animals and humans that absorbed it over a number of years" (I. M. Blake, "Joshua's Curse and Elisha's Miracle" in The Palestine Exploration Quarterly). The cloud of death, rising in the skies from the cities of the plain, frightened not only Lot and his daughters but also Abraham, and he did not feel safe even in the Hebron mountains, some fifty miles away. We are told by the Bible that he pulled up his encamp- ment and moved farther away westward, to reside at Gerar. Also, at no time thereafter did he venture into the Sinai. Even years later, when Abraham's son Isaac wanted to go to Egypt on account of a famine in Canaan, "Y ahweh appeared unto him and said: 'Go not down to Egypt; dwell in the land which I will show thee.' " The passage through the Sinai peninsula was apparently still unsafe. The destruction of the cities of the plain, we believe, was only a sideshow: concurrently, the Spaceport in the Sinai peninsula was also obliterated with nuclear weapons, leaving behind a deadly ra- diation that lingered on for many years thereafter. The main nuclear target was in the Sinai peninsula; and the real victim, in the end, was Sumer itself. Though the end of Ur came swiftly, its sad fate loomed darker ever since the War of the Kings, coming nearer and nearer, like the sound of a distant drummer—an execution's drummer—getting closer, growing louder with each passing year. The Year of Doom—2024 B.C.—was the sixth year of the reign of Ibbi-Sin, the last king of Ur; but to find the reasons for the calamity, explana- tions of its nature, and details of its scope, we will have to study the records of those fateful years back from the time of that war. Having failed in their mission and twice humiliated by the hand of Abraham—once at Kadesh-Barnea, then again near Damascus— the invading kings were promptly removed from their thrones. In Ur, Amar-Sin was replaced by his brother Shu-Sin, who ascended the throne to find the grand alliance shattered and Ur's erstwhile al- lies now nibbling at her crumbling empire. Although they, too, had been discredited by the War of the Kings, Nannar and Inanna were at first the gods in whom Shu-Sin had put his trust. It was Nannar, Shu-Sin's early inscriptions stated, who had "called his name" to kingship; he was "beloved of Inanna." and she herself presented him to Nannar (Fig. 103). "The Holy Inanna." Shu-Sin boasted, "the one endowed with as- tounding qualities, the First Daughter of Sin," granted him weap- ons with which to "engage in battle the enemy country which is disobedient." But all this was insufficient to hold together the Su- merian empire, and Shu-Sin soon turned to greater gods for succor. Judging from the date formulas—annual inscriptions, for royal as well as commercial and social purposes, in which each succes- sive year of a king's reign was designated by the major event of that year—Shu-Sin, in the second year of his reign, sought the favors of Enki by constructing for that god a special boat that could navigate the high seas all the way to the Lower World. The third year of reign was also one of preoccupation with the pro - Enki alignment. Little else is known of this effort, which could have been a roundabout way of pacifying the followers of Marduk and Nabu; but the effort evidently failed, for the fourth and fifth years witnessed the building of a massive wall on the western frontier of Mesopotamia, specifically aimed at warding off incursions by the "Westerners." followers of Marduk. As the pressures from the west kept rising, Shu-Sin turned to the great gods of Nippur for forgiveness and salvation. The date for- mulas, confirmed by the archaeological excavations of the Ameri- can Expedition to Nippur, reveal that Shu-Sin undertook massive reconstruction works at Nippur's sacred precinct, on a scale un- known since the days of Ur-Nammu. The works culminated with the raising of a stela honoring Enlil and Ninlil, "a stela as no king had built before." Desparately Shu-Sin sought acceptance, confir- mation that he was "the king whom Enlil, in his heart, had chosen." But Enlil was not there to answer; only Ninlil, Enlil's spouse, who remained in Nippur, heard Shu-Sin's supplications. Responding with compassion, "so as to prolong the well-being of Shu-Sin, to extend the time of his crown," she gave him a "weapon which with radiance strikes down . . . whose awesome flash reaches the sky." A Shu-Sin text catalogued as "Collection B" suggests that in his efforts to reestablish the olden links with Nippur, Shu-Sin may have attempted a reconciliation with the Nippurites (such as the family of Terah) who had left Ur after the death of Ur-Nammu. The text states that after he made the region where Harran was situ- ated "tremble in awe of his weapons," a peace gesture was made: Shu-Sin sent there his own daughter as a bride (presumably to the region's chief or his son). She then returned to Sumer with an entouragc of that region's citizens, "establishing a town for Enlil and Ninlil on the boundary of Nippur." It was the first time "since the days when fates were decreed, that a king had established a town for Enlil and Ninlil," Shu-Sin stated in obvious expectation of praise. With the probable assistance of the repatriated Nippurites, Shu-Sin also reinstated the high temple services at Nippur- bestowing upon himself the role and title of High Priest. Yet all this was to no avail. Instead of greater security, there were greater dangers, and concern about the loyalty of distant provinces gave way to worry about Sumer's own territory. "The mighty king, the King of Ur," Shu-Sin's inscriptions said, found that the "shepherding of the land"—of Sumer itself—had become the principal royal burden. There was one final effort to entice Enlil back to Sumer, to find shelter under his aegis. On the apparent advice of Ninlil, Shu-Sin built for the divine couple "a great touring boat, fit for the largest rivers. ... He decorated it perfectly with precious stones," outfitted it with oars made of the finest wood, punting poles and an artful rudder, and furnished it with all manner of comfort including a bridal bed. He then "placed the touring boat in the wide basin facing Ninlil's House of Pleasure." From horizon to horizon he hurried. Through the skies, over earth he hurried. To greatly rejoice with his beloved queen, Ninlil. The sentimental journey, however, was only a brief interlude. Some crucial lines before the end of the tablet are missing, so we are deprived of the details of what happened then. But the very last lines refer to "Ninurta, the great warrior of Enlil, who befuddled the Intruder," apparently after "an inscription, an evil inscrip- tion" was discovered on an effigy in the boat, intended perhaps to place a curse on Enlil and Ninlil. There is no record available of Enlil's reaction to the foul play: but all other evidence suggests that he again left Nippur, this time apparently taking Ninlil with him. Soon thereafter—February 2031 B.C. by our calendar—the Near East was awed by a total lunar eclipse, which blacked out the moon during the night tor its full course from horizon to horizon. The or- acle priests of Nippur could not allay Shu-Sin's anxiety: It was. they said in their written message, an omen "to the king who rules the four regions: his wall will be destroyed. Ur will become deso- late." Rejected by the great olden gods. Shu-Sin engaged in one final act—either out of defiance or as a last straw to gain divine support. He went ahead and built—in the very sacred precinct of Nippur—a shrine to a young god named Shara. He was a son of Inanna; and like Lugalbanda. who bore this epithet in earlier days, so was this new Shara ("Prince") a son of a king; in the inscription dedicating the temple. Shu-Sin claimed that he was the young god's father: "To divine Shara. heavenly hero, the beloved son of Inanna: His father Shu-Sin. the powerful king, king of Ur. king of the four re- gions, has built for him the temple Shagipada. his beloved shrine; may the king have life." It was the ninth year of Shu-Sin's reign. It was also his last. The new ruler on the throne of Ur, Ibbi-Sin, could not stop the retreat and retrenchment. All he could do was rush the construction of walls and fortifications in the heart of Sumer, around Ur and Nippur; the rest of the country was left unprotected. His own date formulas, of which none have been found beyond his fifth year (al- though he reigned longer), tell l i t t l e of the circumstances of his days; much more is learned from the cessation of other customary messages and trade documents. Thus, the messages of loyalty, which the other subordinate urban centers were expected to send to Ur each year, ceased to arrive from one center after the other. First to cease were the loyalty messages from the western districts: then, in the third year, the capitals of eastern provinces stopped their dis- patch. In that third year Ur's foreign commerce "stopped with a significant suddenness" (in the words of C. J. Gadd, History and Monuments of Ur). At the tax collection crossroads of Drehem (near Nippur), where shipments of goods and cattle and the collec- tion of taxes thereon were recorded throughout the Third Dynasty of Ur—records of which thousands of intact clay tablets were found—the meticulous account-keeping also stopped abruptly in that third year. asked for guidance and reassurance from his gods; but all he was hearing were oracles of destruction and doom. In the fourth year of his reign he was told that "The Son in the west will arise . . . it is an omen for Ibbi-Sin: Ur shall be judged." In the fifth year, Ibbi-Sin sought further strength by becoming High Priest of Inanna at her shrine at Ur. But that, too, was of no help: that year, the other cities of Sumer itself ceased sending the messages of allegiance. It was also the last year in which those cities delivered the traditional sacrificial animals for Nannar's tem- ple in Ur. The central authority of Ur, her gods, and her great ziggurat-temple were no longer recognized. As the sixth year began, the omens "concerning destruction" became more urgent and more specific. "When the sixth year comes, the inhabitants of Ur will be trapped," one omen stated. The prophesied calamity shall come, another omen said, "When, for the second time, he who calls himself Supreme, like one whose chest has been anointed, shall come from the west." That very year, as messages from the borders reveal, "hostile Westerners had entered the plain" of Mesopotamia; without resistance, they quickly "entered the interior of the country, taking one by one all the great fortresses." All Ibbi-Sin held on to was the enclave of Ur and Nippur; but before the fateful sixth year was out, the inscriptions honoring the king of Ur stopped abruptly also in Nippur. The enemy of Ur and her gods, the "One who calls himself Supreme," had reached the heart of Sumer. Marduk, as the omens had predicted, returned to Babylon for the second time. 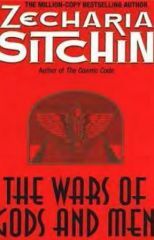 The twenty-four fateful years—since Abraham left Harran, since Shulgi was replaced on the throne, since Marduk's exile among the Hittites had begun—have all converged in that Year of Doom, 2024 B.C. Having followed the separate, but interconnected, bibli- cal tale of Abraham and the fortunes of Ur and its last three kings, we will now follow in the footsteps of Marduk. In its midst [I asked]: "Until when?" 24 years, in its midst, I nested. My temple Esagila as a mount [to raise/rebuild]. My everlasting abode to [reestablish]. In the house of my covenant . . . In the mountlike Esagil . . . By Anu created . . . Into the Esagil . . .
A platform to raise . . . In my city . . . The damaged tablet then lists the cities through which Marduk had passed on his way to Babylon. The few legible city names indi- cate that Marduk's route from Asia Minor to Mesopotamia took him first south to the city of Hama (the biblical Hamat), then eastward via Mari (see map, page 304). He had indeed come to Mesopotamia—as the omens had predicted—from the west, ac- companied by Amorite ("Westerners") supporters. His wish. Marduk continued, was to bring peace and prosperity to the land, "chase away evil and bad luck . . . bring motherly love to Mankind." But it all came to naught: Against his city, Bab- ylon, an adversary god "his wrath had brought." The name of this adversary god is stated at the very beginning of a new column of the text; but all that has remained of it is the first syllable: "Divine NIN-." The reference could have been only to Ninurta. Euphrates valley toward Nippur, and Ninurta organized Elamite troops to fight them. As we read and reread the record of those trying times, we find that to accuse an enemy of atrocities is not a modern innovation. The Babylonian text—written, we must keep bearing in mind, by a worshiper of Marduk—attributes to the Elamite troops, and to them alone, the desecration of temples, including the shrines of Shamash and Ishtar. The Babylonian chronicler goes even farther: he accuses Ninurta of falsely blaming on the followers of Marduk the desecration of Enlil's Holy-of-Holies in Nippur, thereby pro- voking Enlil to take sides against Marduk and his son Nabu. It happened, the Babylonian text relates, when the two opposing armies faced each other at Nippur. It was then that the holy city was despoiled and its shrine, the Ekur, desecrated. Ninurta ac- cused the followers of Marduk of this evil deed; but it was not so: it was his ally Erra who had done it! break down the enclosure of the shrine!" When Enlil, "loftily enthroned." heard that his temple had been destroyed, its shrine defiled, that "in the holy of holies the veil was torn away," he rushed back to Nippur. "Riding in front of him were gods clothed with radiance"; he himself "set off brilliance like lightning" as he came down from the skies (Fig. 104); "he made the holy place shake" as he descended to the sacred precinct. Enlil then addressed himself to his son, "the prince Ninurta." to find out who had defiled the sacred place. But instead of telling the truth, that it was Erra, his ally, Ninurta pointed the accusing finger at Marduk and his followers. . . . Describing the scene, the Babylonian text asserts that Ninurta was acting without the required respect on meeting his father: "not fearing for his life, he removed not his tiara." T o Enlil "evil he spoke. . . there was no justice; destruction was conceived." And so provoked, "Enlil against Babylon caused evil to be planned." From Ezida . . .
Toward the great sea he set his course. But when the son of Marduk in the land of the coast was, He-of-the-Evil-Wind [Erra] with heat the plain-land burnt. These are indeed verses that must have had a common source with the biblical description of how "brimstone and fire" rained from the skies "upheavaled those cities and the whole plain"! He [Nabu] the great sea entered. [Because] Ezida, the legitimate abode, was overrun. The picture that can be gathered from the biblical and Babylo- nian texts of the cataclysm that engulfed the ancient Near East in the time of Abraham is much more fully detailed in The Erra Epic (to which we have already referred earlier). First pieced together from fragments found in the library of Ashurbanipal in Nineveh, the Assyrian text began to take shape and meaning as more frag- mented versions were unearthed at other archaeological sites. By now it is definitely established that the text was inscribed on five tablets: and in spite of breaks, missing or incomplete lines, and even some disagreement among the scholars where some frag- ments belong, two extensive translations have been compiled: Das Era-Epos by P. F. Gossmann, and L'Epopea di Erra by L. Cagni. The Erra Epic not only explains the nature and causes of the con- flict that had led to the unleashing of the Ultimate Weapon against inhabited cities and the attempt to annihilate a god (Nabu) believed hiding therein. It also makes clear that such an extreme measure was not taken lightly. We know from several other texts that the great gods, at that time of acute crisis, were sitting in a continuous Council of War, keeping constant communication with Anu: "Anu to Earth the words was speaking, Earth to Anu the words pronounced." Erra Epic adds the information that before the awesome weapons were used, one more confrontation had taken place between Nergal/Erra and Marduk. in which Nergal used threats to persuade his brother to leave Babylon and give up his claims to Supremacy. But this time, persuasion failed; and back at the Council of the Gods, Nergal voiced the recommendation for the use of force to dislodge Marduk. We learn from the texts that the discussions were heated and acrimonious; "for one day and one night, without ceasing" they went on. An especially violent argument developed between Enki and his son Nergal, in which Enki stood by his firstborn son: "Now that Prince Marduk has arisen, now that the people for the second time have raised his image, why does Erra continue his opposition?" Enki asked. Finally, losing his patience, Enki shouted at Nergal to get out of his presence. Leaving in a huff, Nergal returned to his domain. "Consulting with himself," he decided to unleash the awesome weapons: "The lands I will destroy, to a dust-heap make them; the cities I will up- heaval, to desolation turn them; the mountains I will flatten, their animals make disappear; the seas I will agitate, that which teems in them I will decimate; the people I will make vanish, their souls shall turn to vapor; none shall be spared. . . ."
We learn from a text known as CT-xvi-44/46 that it was Gibil, whose domain in Africa adjoined that of Nergal, who alerted Mar- duk to the destructive scheme hatched by Nergal. It was nighttime, and the great gods had adjourned for rest. It was then that Gibil "these words to Marduk did speak" in regard to the "seven awe- some weapons which by Anu were created; . . . The wickedness of those seven against thee is being laid." he informed Marduk. Those seven, in the mountain they abide. In a cavity inside the earth they dwell. From this place with a brilliance they will rush forth. From Earth to Heaven, clad with terror. But where exactly is this place? Marduk asked again and again; and all Gibil could say was that "even the wise gods, to them it is unknown." Now Marduk rushed to his father Enki with the frightening report. "T o his father Enki's house he fMardukj entered." Enki was lying on the couch in the chamber to which he retired for the night. "My father," Marduk said, "Gibil this word hath spoken to me: of the coming of the seven [weapons] he has found out." Telling his father the bad news, he urged his all-knowing father: "Their place to search out, do hasten thou!" Soon the gods were back in council, for even Enki knew not the exact hiding place of the Ultimate Weapons. To his surprise, not all the other gods were as shocked as he was. Enki spoke out strongly against the idea, urging steps to stop Nergal, for the use of the weapons, he pointed out, "the lands would make desolate, the people will make perish." Nannar and Utu wavered as Enki spoke; but Enlil and Ninurta were for decisive action. And so, with the Council of the Gods in disarray, the decision was left to Anu. ("The Scorcher"), it relates in great detail how Ninurta had made clear to Nergal/Erra that the weapons could be used only against specifically approved targets; that be- fore they could be used, the Anunnaki gods at the selected sites and the Igigi gods manning the space platform and the shuttlecraft had to be forewarned; and, last but not least, mankind had to be spared, for "Anu, lord of the gods, on the land had pity." Will you the righteous destroy with the unrighteous? Will you destroy those who have against you sinned together with those who against you have not sinned? Employing flattery, threats, and logic, the two gods argued back and forth on the extent of the destruction. More than Ninurta, Nergal was consumed by personal hatred: "I shall annihilate the son, and let the father bury him; then I shall kill the father, let no one bury him!" he shouted. Employing diplomacy, pointing out the injustice of indiscriminate destruction—and the strategic merits of selective targeting—the words of Ninurta finally swayed Nergal. His mother shall cease her laughter . . . The place from where the Great Ones ascend I shall upheaval. Ishum too went forth, in accordance with the word given, a squeezing in his heart. The Awesome Seven, [weapons] without parallel, trailed behind him. in its forests not a tree-stem was left standing. So, with one nuclear blow, the Spaceport was obliterated, the mount within which its controls were hidden smashed, the plain that served its runways obliterated. ... It was a destructive feat, the written record attests, performed by Ninurta (Ishum). Erra the King's Highway followed. to desolation he overturned them. their animals he made perish. He dug through the sea, its wholeness he divided. As with fire he scorched the animals, banned its grains to become as dust. The Erra Epic thus encompasses all the three aspects of the nu- clear event: the obliteration of the Spaceport in the Sinai; the "overturning" ("upheavaling" in the Bible) of the cities of the Jordan plain; and the breach in the Dead Sea resulting in its exten- sion southward. One could expect that such a unique destructive event would have been recorded and mentioned in more than a single text; and indeed we find descriptions and recollections of the nuclear upheaval in other texts as well. Who rained stones and fire upon the adversaries. At that time, in the reign of a previous king, conditions changed. Good departed, suffering was regular. The Lord [of the gods] became enraged, he conceived wrath. the gods of that place abandoned it . . .
its protectors went up to the dome of heaven. and he of the evil wind [Erra/Nergal] together performed their evil. made them flee the scorching. its place they made desolate. Thus was the Spaceport, the prize over which so many Wars of the Gods had been fought, obliterated: the Mount within which the controlling equipment was placed was smashed; the launch plat- forms were made to fade off the face of the Earth; and the plain whose hard soil the shuttlecraft had used as runways was obliter- ated, with not even a tree left standing. The great place was never to be seen again ... but the scar made in the face of the Earth that awesome day can still be seen—to this very day! It is a vast scar, so vast that its features can be seen only from the skies—revealed only in recent years as satel- lites began to photograph the Earth (Fig. 105). It is a scar for which no scientist has hitherto offered an explanation. Stretching north of this enigmatic feature in the face of the Sinai peninsula is the flat central plain of the Sinai—a remnant of a lake from an earlier geological era; its flat, hard soil is ideal for the landing of shuttlecraft—the very same reason which made the Mo- jave Desert in California and the Edwards Air Force Base there ideal for the landing of America's space shuttles. As one stands in this great plain in the Sinai peninsula—its hard, flat soil having served for tank battles in recent history as it did the shuttlecraft in antiquity—one can see in the distance the mountains that surround the plain and give it its oval shape. The limestone mountains loom white on the horizon; but where the great central plain adjoins the immense scar in the Sinai, the hue of the plain—black—stands out in sharp contrast to the surrounding whiteness (Fig. 106). gray and dark brown but nowhere the black which comes in nature from basalt stones. Yet here, in the central plain north-northeast of the enigmatic giant scar, the soil's color has a black hue. It is caused—as our pho- tograph clearly shows—by millions upon millions of bits and pieces of blackened rock, strewn as by a giant hand over the whole area (Fig. 107). There has been no explanation for the colossal scar in the face of the Sinai peninsula since it was observed from the skies and photo- graphed by NASA satellites. There has been no explanation for the blackened bits and pieces of rock strewn over the area in the central plain. No explanation—unless one reads the verses of the ancient texts and accepts our conclusion that in the days of Abraham. Nergal and Ninurta wiped out the Spaceport that was there with nuclear weapons: "That which was raised towards Anu to launch they caused to wither, its face they made fade away, its place they made desolate." And the Spaceport, even the Evil Cities, were no more. Far away to the west, in Sumer itself, the nuclear blasts and their brilliant flashes were neither felt nor seen. But the deed done by Nergal and Ninurta had not gone unrecorded, for it turned out to have had a most profound effect on Sumer, its people, and its very existence. A storm, the Evil Wind, went around in the skies. And then the radioactive whirlwind began to spread and move westward with the prevailing winds blowing from the Mediterra- nean; soon thereafter, the omens predicting the end of Sumer came true; and Sumer itself became the ultimate nuclear victim. The catastrophe that befell Sumer at the end of Ibbi-Sin's sixth year of reign is described in several Lamentation Texts—long poems that bewail the demise of the majestic Ur and the other centers of the great Sumerian civilization. Bringing very much to mind the biblical Book of Lamentations, lamenting the destruction of Je- rusalem by the hands of the Babylonians, the Sumerian lamenta- tions suggested to the scholars who had first translated them that the Mesopotamian catastrophe was also the result of an invasion— this one by clashing Elamite and Amorite troops. When the first lamentation tablets were found, the scholars be- lieved that Ur alone suffered destruction, and they titled the trans- lations accordingly. But as more texts were discovered, it was realized that Ur was neither the only city affected, nor the focal point of the catastrophe. Not only were similar lamentations found bewailing the fate of Nippur, Uruk, Eridu, but some of the texts also provided lists of the affected cities: they appeared to begin in the southwest and extend to the northeast, encompassing the whole of southern Mesopotamia. It became apparent that a general, sud- den, and concurrent catastrophe had befallen all the cities—not in slow succession, as would happen in the case of a progressive inva- sion, but all at once. Such scholars as Th. Jacobsen (The Reign of Ibbi-Sin) then concluded that the "barbarian invaders" had nothing to do with the "dire catastrophe," a calamity he called "really quite puzzling." "Whether we shall ever see with full clarity what happened in those years," Jacobsen wrote, "only time will tell; the full story, we are convinced, is still far beyond our grasp." But the puzzle can be solved, and the full story grasped, if we relate the catastrophe in Mesopotamia to the nuclear explosion in the Sinai. that its steppes grow withering plants. In the cities and the hamlets. ' 'the mother cares not for her chil- dren, the father says not 'O my wife' ... the young child grows not sturdy on their knee, the nursemaid chants not a lullaby . . . kingship has been taken away from the land." Before World War II had ended, before Hiroshima and Nagasaki were upheavaled with atomic weapons rained on them from the skies, one could still read the biblical tale of Sodom and Gomorrah and leave be the traditional "sulphur and brimstone" for lack of a better explanation. To scholars who had not yet come face-to-face with the awesomeness of nuclear weapons, the Sumerian lamenta- tion texts bespoke (as the scholars titled them) the "Destruction of Ur" or the "Destruction of Sumer." But that is not what these texts describe: they describe desolation, not destruction. The cities were there but without people; the stalls were there but without cat- tle; the shcepfolds remained but were empty; the rivers flowed but their waters became bitter; the fields still stretched but they grew only weeds; and on the steppe the plants sprouted, only to wither away. One that had never been seen before, one which could not be withstood. The death was not by the hand of an enemy; it was an unseen death, "which roams the street, is let loose in the road; it stands beside a man—yet none can see it; when it enters a house, its ap- pearance is unknown." There was no defense against this "evil which has assailed the land like a ghost: . , . does not grant them another day . . .
heads wallowed in blood . . . The face was made pale by the Evil Wind. The source of the unseen death was a cloud that appeared in the skies of Sumer and "covered the land as a cloak, spread over it like a sheet." Brownish in color, during the daytime "the sun in the ho- rizon it obliterated with darkness." At night, luminous at its edges ("Girt with dread brilliance it filleth the broad earth") it blocked out the moon: "the moon at its rising it extinguished." Moving from west to east, the deathly cloud—"enveloped in terror, casting fear everywhere"—was carried to Sumer by a howling wind, "a great wind which speeds high above, an evil wind which over- whelms the land." It was not, however, a natural phenomenon. It was "a great storm directed from Anu ... it hath come from the heart of En- lil." The product of the seven awesome weapons, "in a single spawning it was spawned . . . like the bitter venom of the gods; in the west it was spawned." The Evil Wind, "bearing gloom from city to city, carrying dense clouds that bring gloom from the sky." was the result of a "lightning flash:"
"From the midst of the mountains it had descended upon the land, from the Plain of No Pity it hath come." were the heralds of the pestilence. immense brilliance: "they spread awesome rays towards the lour points of the earth, scorching everything like fire," one text stated; another, a lamentation over Nippur, recalled "the storm, in a flash of lightning created." An atomic mushroom—"a dense cloud that brings gloom"—then rose to the sky; it was followed by "rushing wind gusts ... a tempest that furiously scorches the heavens." Then the prevailing winds, blowing from west to east, began to spread toward Mesopotamia: "the dense clouds that bring gloom from the sky, that bear the gloom from city to city." and covered as with a shadow . . . The lamentation texts identified the site of the awesome blasts as "in the west," near "the breast of the sea"—a graphic description of the curving Mediterranean coast at the Sinai peninsula—from a plain "in the midst of the mountains," a plain that became a "Place of No Pity." It was a place that served before as the Place of Launching, the place from which the gods ascended toward Anu. In addition, a mount also featured in many of these place identifications. In the Erra Epic, the mount near "the place from which Great Ones ascend" was called the "Mount Most Su- preme"; in one of the lamentations it was called the "Mount of Howling Tunnels." This last epithet brings to mind the descrip- tions, in the Pyramid Texts, of the tunneled mount with sloping un- derground passages, to which Egyptian Pharaohs journeyed in search of an afterlife. In The Stairway to Heaven we have identi- fied it with the mount Gilgamesh had reached in his journey to the Place of the Rocketships, in the Sinai peninsula. Starting from that mount, a lamentation text stated, the blast's deadly cloud was carried by the prevailing winds eastward all the way "to the boundary of Anshan" in the Zagros Mountains, affect- ing all of Sumer from Eridu in the south to Babylon in the north. The unseen death moved slowly over Sumer, its passage lasting twenty-four hours—a day and a night that were commemorated in laments, as in this one from Nippur: "On that day, on that single day: on that night, on that single night ... the storm, in a flash of lightning created, the people of Nippur left prostrate." The Uruk Lament vividly describes the confusion among both the gods and the populace. Stating that Anu and Enlil had over- ruled Enki and Ninki when they "determined the consensus" to employ the nuclear weapons, the text asserts that none of the gods anticipated the awesome outcome: "The great gods paled at its im- mensity" as they witnessed the explosion's "gigantic rays reach up to heaven (and] the earth tremble to its core." As the Evil Wind began to "spread to the mountains as a net," the gods of Sumer began to flee their beloved cities. The text known as Lamentation Over the Destruction of Ur lists all the great gods and some of their important sons and daughters who had "abandoned to the wind" the cities and great temples of Sumer. The text called Lamentation Over the Destruction of Sumer and Ur adds dramatic details to this hurried abandonment. Thus. "Ninhar- sag wept in bitter tears" as she escaped from Isin; Nanshe cried, "O my devastated city" as "her beloved dwelling place was given over to misfortune." Inanna hurriedly departed from Uruk, sailing off toward Africa in a "submersible ship" and complaining that she had to leave behind her jewelry and other posses- sions. ... In her own lamentation for Uruk, Inanna/Ishtar be- wailed the desolation of her city and her temple by the Evil Wind "which in an instant, in a blink of an eye was created in the midst of the mountains," and against which there was no defense. They hid in the mountains. They escaped to the distant plains. In Uruk, the populace was left in chaos, leaderless and helpless. "Mob panic was brought about in Uruk ... its good sense was distorted." The shrines were broken in and their contents were smashed as the people asked questions: "Why did the gods' benev- olent eye look away? Who caused such worry and lamentation?" But their questions remained unanswered; and when the Evil Storm passed over, "the people were piled up in heaps ... a hush settled over Uruk like a cloak." Ninki, we learn from The Eridu Lament, flew away from her city to a safe haven in Africa: "Ninki, its great lady, flying like a bird, left her city." But Enki left Eridu only far enough to get out of the Evil Wind's way, yet near enough to see its fate: "Its lord stayed outside his city .... Father Enki stayed outside the city . . . for the fate of his harmed city he wept with bitter tears." Many of his loyal subjects followed him, camping on its outskirts. For a day and a night they watched the storm "put its hand" on Eridu. After the "evil-bearing storm went out of the city, sweeping across the countryside." Enki surveyed Eridu; he found a city "smothered with silence ... its residents stacked up in heaps." Those who were saved addressed to him a lament: "O Enki," they cried, "thy city has been cursed, made like an alien terri- tory!" and they kept on asking whence should they go, what should they do. But though the Evil Wind had passed, the place was still unsafe, and Enki "stayed out of his city as though it were an alien city." "Forsaking the house of Eridu," Enki then led "those who have been displaced from Eridu" to the desert, "to- wards an inimical land"; there he used his scientific powers to make the "foul tree" edible. From the northern edge of the Evil Wind's wide swath, from Babylon, a worried Marduk sent his father, Enki, an urgent mes- sage as the cloud of death neared his city. "What am I to do?" he asked. Enki's advice, which Marduk then related to his followers, was that those who could should leave the city—but go only north; and in line with the advice given by the two emissaries to Lot, the people fleeing Babylon were warned "neither to turn nor to look back." They were also told not to take with them any food or bev- erage, for these might have been "touched by the ghost." If escape was not possible, Enki advised hiding underground: "Get thee into a chamber below the earth, into a darkness," until the Evil Wind was gone. the storm caught up with her. . .
Ur was granted kingship it was not granted an eternal reign. Since days of yore, when Sumer was founded, to the present, when people have multiplied— Who has ever seen a kingship of everlasting reign? While the appeals were made, Ningal recalled in her long poem, "the storm was ever breaking forward, its howling overpowering all." It was daytime when the Evil Wind approached Ur: "al- though of that day I still tremble," Ningal wrote, "of that day's foul smell we did not flee." As night came, "a bitter lament was raised" in Ur; yet the god and goddess stayed on; "of that night's foulness we did not flee," the goddess stated. Then the affliction reached the great ziggurat of Ur, and Ningal realized that Nannar "had been overtaken by the evil storm." Ningal and Nannar spent a night of nightmare, which Ningal vowed never to forget, in the "termite house" (underground chamber) within the ziggurat. Only next day. when "the storm was carried off from the city." did "Ningal, in order to go from her city . . . hastily put on a garment," and together with the stricken Nannar departed from the city they so loved. As they were leaving they saw death and desolation: "the peo- ple, like potsherds, filled the city's streets; in its lofty gates, where they were wont to promenade, dead bodies were lying about; in its boulevards, where the feasts were celebrated, scattered they lay; in all of its streets, where they were wont to promenade, dead bodies were lying about; in its places where the land's festivities took place, the people lay in heaps." The dead were not brought to buri- al: "the dead bodies, like fat placed in the sun, of themselves melted away." O house of Sin in Ur, bitter is thy desolation . . .
make thy heart like water! how can one now exist? have been given over to the wind. "On the steppe, cattle large and small become scarce, all living creatures come to an end." The domesti- cated animals, too, were wiped out: "The sheepfolds have been delivered to the wind. . . . The hum of the turning churn resounds not in the sheepfold. . . . The stalls provide not fat and cheese. . . . Ninurta has emptied Sumer of milk." "The storm crushed the land, wiped out everything; it roared like a great wind over the land, none could escape it; desolating the cities, desolating the houses. . . . No one treads the highways, no one seeks out the roads." The desolation of Sumer was complete. Seven years alter the Evil Wind had desolated Sumer, life began to stir again in the land. But instead of an empire ruling others, Sumer itself was now an occupied land, with a semblance of order maintained by Elamite troops in the south and Gutian soldiers in the north. Isin, a city never a capital before, was selected as a temporary administrative center, and a former governor of Mari was brought over to rule the land. Documents from that time recorded a com- plaint that one "who is not of Sumerian seed" was given the reins over Sumer. As his Semitic name—lshbi-Erra—attested, he was a follower of Nergal, and his appointment must have been part of the arrangement between Nergal and Ninurta. Some scholars call the decades that followed the demise of Ur a Dark Age in Mesopotamian history. Little is known of those trying times except for what is gleaned from the yearly date formulas. Im- proving security, restoring here and there. lshbi-Erra—seeking to solidify his secular authority—dismissed the foreign garrison that patrolled Ur and, by extending his reign to that city, laid claim to being a successor to the kings of Ur; but only a few other resettled cities acknowledged his supremacy, and at Larsa a powerful local chief posed, at times, a challenge. A year or two later lshbi-Erra sought to add the central religious au- thority to his powers by assuming the guardianship of Nippur, raising there the sacred emblems of Enlil and Ninurta. But the permission for that came from Ninurta alone, and the great gods of Nippur remained aloof and alienated. Seeking other support. Ishhi-Erra appointed priests and priestesses to restore the worship of Nannar. Ningal. and Inanna. 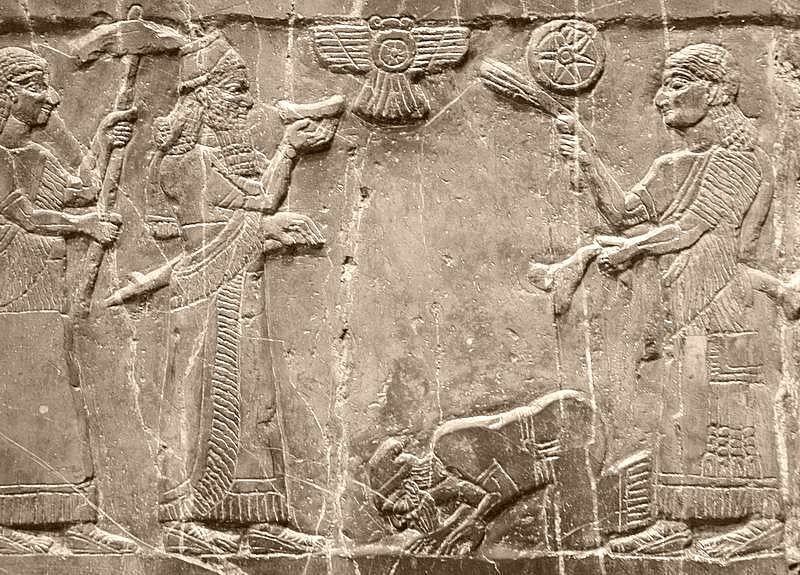 But it seems that the hearts of the people belonged elsewhere: as numerous Shurpu ("Purification") texts suggest, it was Enki and Marduk—using Enki's immense scientific knowledge ("magical powers" in the eyes of the people)—who cured the afflicted, purified the waters, and made the soil grow edible vegetation again. For the next half-century, embracing the reign of two successors of lshbi-Erra at Isin, normalcy gradually returned to the land; agri- culture and industry revived, internal and external trade resumed. But it was only after the passage of seventy years sinee its defilement—the same interval that later on applied to the dese- crated temple in Jerusalem—that the temple of Nippur could be re- built by the third successor on the throne of Isin, Ishme-Dagan. In a long poem of twelve stanzas dedicated to Nippur, he described how its divine couple responded to his appeals to restore the city and its great temple, so that "Nippur's brickwork be restored" and "the divine tablets be returned to Nippur." There was great jubilation in the land when the great temple was rededicated to Enlil and Ninlil. in the year 1953 B.C. : it was only then that the cities of Sumer and Akkad were officially declared habitable again. The official return to normalcy, however, only served to stir up old rivalries among the gods. The successor to Ishme-Dagan bore a name indicating his allegiance to Ishtar. Ninurta put a quick end to that, and the next ruler at Isin—the last one ever to bear a Sumerian name—was one of his followers. But this claim of Ninurta to the restored land could not be upheld: after all. he had caused, even if indirectly. Sumer's destruction. As the next successor's name sug- gests. Sin then sought to reassert his authority: but the days of his and Ur's supremacy were over. who determines the destinies of the land. Determined for Marduk. the firstborn of Enki. Made him great among the gods who watch and see. Called Babylon by name to be exalted. And established for Marduk, in its midst. an everlasting kingship.